Malaria deaths registered in Mexican localities, 1932. The primary data sources used in my dissertation are drawn from archival documents that I viewed and photographed at various sites in Mexico and the United States from 2012-2014. You can see a complete description of archival materials collected here. The archives yielded a wide range of relevant documents, including administrative data, such as the local-level count of malaria deaths pictured here. In addition to these, I also uncovered extensive programmatic materials, including reports by bureaucratic agencies and foundation officers; maps detailing the geographic extent of malaria control campaigns; and a detailed numerical accounting of the large-scale DDT spraying campaign carried out in Mexico from 1958-1960. I was able to collect these data thanks to financial support from: the National Science Foundation, the University of California Institute for Mexico and the United States, and the Rockefeller Archive Center. Together with colleagues at UCSD, UCLA and UC Riverside, I will be fielding a survey in January of 2016 designed to understand the issues facing immigrant students in San Diego County and TIjuana, Mexico. The survey will be based on a sample of over 5,000 students in high schools in three border-region school districts. Data collection will be carried out primarily by student participants in the Mexican Migration Field Research and Training Program (MMFRP). Below is a description of the research carried out by the MMFRP during the 2013-2014 academic year, when I served as program director. 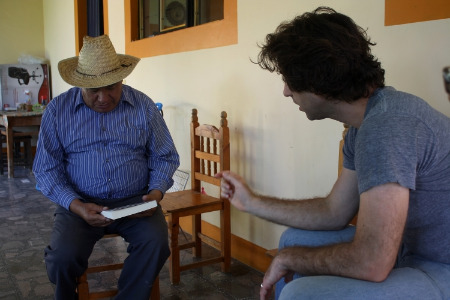 Presenting the results of a previous survey to an inhabitant of San Miguel Tlacotepec, Oaxaca, Mexico. In rural Mexico, my team of 30 interviewers collected information about the social network ties of the town’s inhabitants, using software developed and implemented by my co-author D. Alex Hughes. In a paper using the resulting data, we find that network ties influence potential migrants’ knowledge of U.S. immigration policy. Using the same team of interviewers, I supervised survey data collection from Mexican migrants living in San Diego county. Data were collected using a multistage probability sample, designed by economist Enrico Marcelli. Within the random sample, I implemented a voting experiment designed with my co-author Rosario Aguilar. In the paper based on this experiment, we show that Mexican migrants to the United States react positively to candidates with darker skin tones and more indigenous features. This finding complements previous experimental results, which showed that non-migrant Mexicans prefer candidates with lighter skin tones and less indigenous features. Partisanship of Mexican municipalities, 2002. In a project supported by the Hewlett Foundation, co-author Alberto Diaz-Cayeros and I use contemporary Mexico as a test case for understanding the impact of democracy on public goods provision. The project leverages vital records data (the approximately 7.5 million death registrations and 40 million birth registrations that are publicly available at present) to show that democratization at the local level has led to reductions in child mortality. In the first paper resulting from this project, we show that the onset of democratic competition in Mexican municipalities led to lower levels of post-neonatal infant mortality. Project maps can be viewed here. Partisanship and Child Health in the U.S. In an ongoing project, I investigate whether the partisanship of U.S. counties affects the health of county inhabitants, focusing on immigrants and racial minorities. With my colleague Christopher Fariss, I have supervised the collection of over 100 million birth records for the United States, covering the period 1968-2004. The birth records are combined with census and other data sources on the demographic and economic characteristics of U.S. counties, in addition to county-level voting results. We measure the impact of partisanship on children’s birthweight, a key indicator of health.